What a wonderful story, I look forward to reading Ember Island. Wow! So excited that you have written another in the ‘Freeman’ series. After stumbling across ‘Lighthouse Bay’ at the airport (!yay) (and then sharing with my Bookclub who all love live love it too ) I have just devoured Wildflower Hill and Duets. I was already feeling so connected to your themes – I love history, travel, the arts, mystery and hidden secrets, womens strength and the sense of place here in Austalia that you capture so beautifully. And now I read you are a re-invented coastie! No wonder there’s a connection. I am currently piecing my past and present together (a bit like Angela Smith only not quite as dramatically) – including being proud of rough coastie roots. Can’t wait to read Ember Island!!! 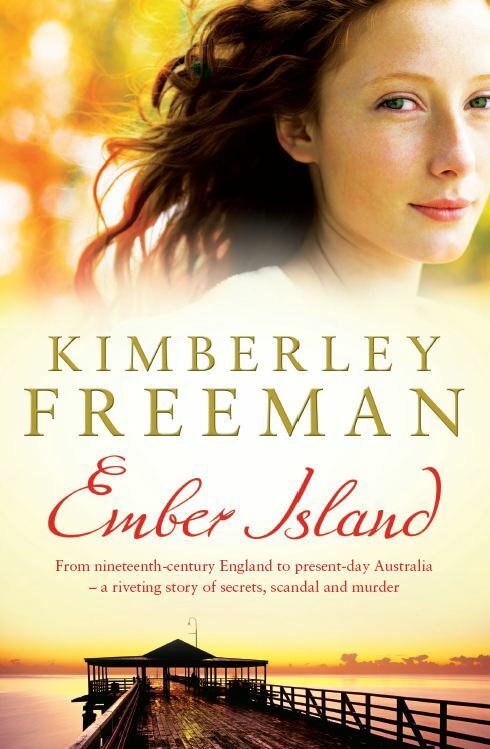 Have just finished Ember Island – couldn’t put it down. Felt I was right there on the island with Tilly….. Fantastic story and characters. So well written. Hello Kimberley.I’m reading a book right now the Ember Island.My mother read the first book.My mother loves your books.Like the other books in this wonderful book.I love the characters you created, but there are also’d love inside.For example, Percy and Jasper.I love reading books you wrote.Take care of yourself and never stop writing. Hello Kimberly. I have loved all your novels and love that you are comfortable embracing the beauty of where you grew up. There is always beauty when you look back at a rough past from an adult perspective. It made you the accomplished writer you are because you understand human nature from a variety of backgrounds. It is always most refreshing to live in the freedom of being yourself. Can’t wait for your next novel. What a lovely thought. Glad you enjoyed the books. I just finished _Ember Island_ today, and I loved it. I live in the US, and have been reading Australian authors since my penpal recommended the Phryne Fisher series. Kate Morton, Stedman, Grenville, and of course, Kerry Greenwood, and now you, are my favorites!! I stumbled upon _Wildflower Hill_ on Goodreads, devoured it, went on to _Evergreen Falls_, and then _Ember Island_. I really like how you tell two related stories at once. And I like that they have satisfying endings–not sappy happy endings, but not ending so sad that I feel sad for days on end. I look forward to reading the next book in the series. Thank you!! Thanks for your generous comments, Casey. I’m at work on the new one as we speak. If you read the book a second time, all the answers are in there! Save to say there is no direct connection between Agnes and Tori, just that Tori’s mum was sent the letter by somebody who found it in the back of an old book (because she’s a history professor). Hi Kimberley, a habit of mine is to listen to audio books on my way to and from meetings. I’ve just finished “Lighthouse Bay” and absolutely loved every bit of it. Until then, I was a “Kimberley Freeman virgin” (yes, I had a background similar to yours). I grew up in Inala in the 60s and 70s, raised by my widowed aunt and my mother who was, what was known back then as a deserted wife. I, like you, am trying to re-invent myself somewhat without forgetting my roots, but I’ve left this journey to my mid-50s. Just reading your blog has been inspired me. I graduated from the University of Tasmania with a Diploma (a long way from a PhD, I know). Thanks again. sorry it took so long to respond. I lost my password and am technologically negligent. lovely to hear from you and I’m glad you loved the books. I know the staff who run that course! I have just finished “Duet” at 4:26 am. I will be very tired tomorrow! I congratulate you on escaping your roots and educating yourself. We are not responsible for the circumstances of our childhood, but we can choose what we do and who we become afterwards.